After a recent update I switched on my Apple TV prepared to watch a movie I’d ripped from a DVD I own. It—and other movies I’ve ripped—are gone! What happened to them? With the latest iTunes and Apple TV, Apple categorizes such movies (any variety of video that wasn’t obtained from the iTunes Store) as home videos. 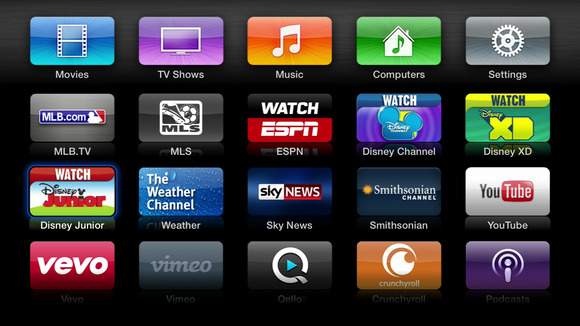 When you select Computers on your Apple TV you will see an entry for Home Videos as the fourth item in the media list. If you select that item and then click the remote’s Select button, all your ripped movies should appear. If, like me, you find it a bit silly to separate your Apple-purchased movies from those you’ve ripped (and yes, you should do this only with discs that you own), you can correct this behavior. To do so, you’ll need to change the media type for these movies from Home Video to Movies. There are a couple of ways to do this in iTunes. The first is to select Movies in iTunes, click the Home Videos heading in the main window, select everything in that window, press Command-I, click the Options tab, choose Movie from the Media Kind pop-up menu, and click OK.
Changing the media type of multiple "home videos." I find this method a little clumsy because there may be smaller movies—movies of the family that you’ve created with iMovie, for example—that really are home videos. Use the method I just described and that stuff gets mixed in with your Hollywood hits. What I would suggest instead is that you choose File > New > Smart Playlist and in the window that appears configure the one and only condition to read Media Kind Is Home Video and click OK. You’ll be presented with a list of all the videos in your iTunes Library tagged as home videos. Now click the Time column heading twice so that the movies with the greatest length appear at the top. These are likely to be the movies you ripped rather than the video of your kids bombarding each other with water balloons. Select these videos and then run through the procedure I just outlined.